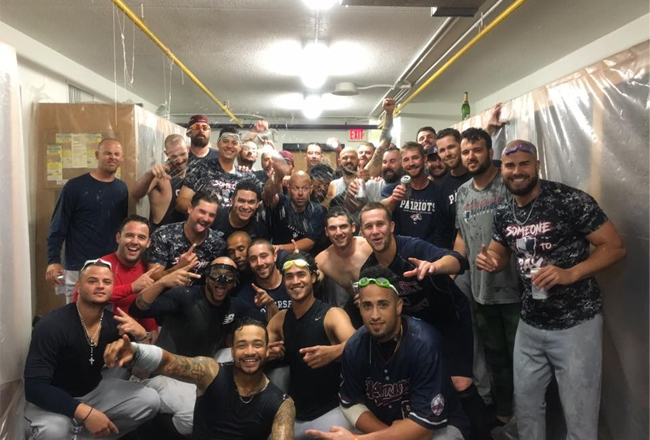 (New Britain, Conn., Sept. 16, 2016) - The Somerset Patriots clinched the Second Half Liberty Division Championship by defeating the New Britain Bees 5-1 Friday evening at New Britain Stadium. The Patriots have qualified for the postseason four straight years and 13 times in the franchises 19 years of existence. Somerset will battle the Long Island Ducks in the Liberty Division Championship Series that begins Wednesday, September 21st at TD Bank Ballpark for a best-of-five series. The Patriots got off to a booming start as Eric Farris clubbed a two-run home run (8) and the ensuing batter Bryan LaHair followed with a solo home run (10). It was just the third time all year the Patriots clubbed back-to-back home runs. The Bees lone run occurred via a wild pitch in the bottom of the second inning. Somerset added to its 3-1 lead in the fifth and sixth innings with RBI singles from Aharon Eggleston and Rob Kral to make the score 5-1, which would be the final. Will Oliver (7-2) earned the win, allowing just one run on six hits and seven strikeouts in seven innings pitched. For the 14th time in 16 starts he yielded three runs or fewer. Nate Roe (5-3) suffered the loss as he surrendered four runs in 4.2 innings of work. The 2016 Somerset Patriots season presented by Ford continues on the road until the Liberty Division Series against the Long Island Ducks begins at TD Bank Ballpark on Wednesday, September 21st. For information, call 908-252-0700 or visit www.somersetpatriots.com. Download our Mobile App for free in the Apple or Android App store.